Channel 9 News followed Aussie for a week for a special feature on Aussie success stories in the UK. SW London Chargers, pictured here at there most recent game, are sponsored by Aussie. Their season has kicked off again. The 1sts are so far undefeated in the league and have booked themselves a position in the London Cup final for which they are the defending champs. We are busier than ever at the moment, typically moving over 350 homes a week in London. Normally these are flats or houses firmly on dry land, but we recently moved our first floating home. This beautiful houseboat is mored in Richmond and it comfortably absorbed the contents of a four bedroom flat, with room to spare. Round 1 of the Tetley’s Challenge Cup kicked off last weekend and SW London Chargers were the feature game of the round. Aussie’s Operations Manager, Terance Puna, was happy after he’d opened the scoring by beating two Welsh opponents to touch-down after 30 minutes of stalemate. The chargers were the dominant side and scored a second try early into the 2nd half. They went on to win the game 12-6, after a last-minute try was scored by the Torfaen Tigers. The Challenge Cup was on display for the duration of the match and the Aussie Man and Van-sponsored team were ecstatic to get their photo taken with it after a hard-fought win. 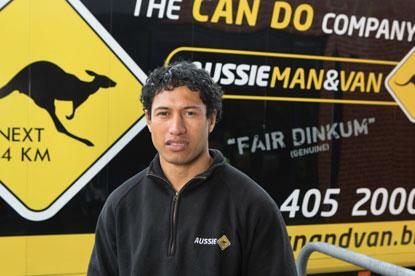 My name is Terance Puna and I’m the Operations Manager at Aussie Man & Van. Since 1996, I have worked at our parent company, Ward Thomas, where I rose through the ranks to the position of Head Driver. I then gained promotion at Ward Thomas, and was made Warehouse Manager, before migrating to my current role at Aussie Man & Van. People normally pick container storage because they plan to store their items for a prolonged period and neither want nor need regular access to their possessions. Container storage is the cheapest option for that very reason.